Sadly, there are some errors in the data that the measuring stations submit to SINAICA. Internally, the stations and SINAICA are supposed to flag data that is mistaken, but this is not always the case; in addition, not all stations send their data to SINAICA in a reliable way. First, let’s load the packages necessary for the analysis. The data is incomplete in the sense that some networks don’t report the values of all the pollutants they measure in a timely manner. 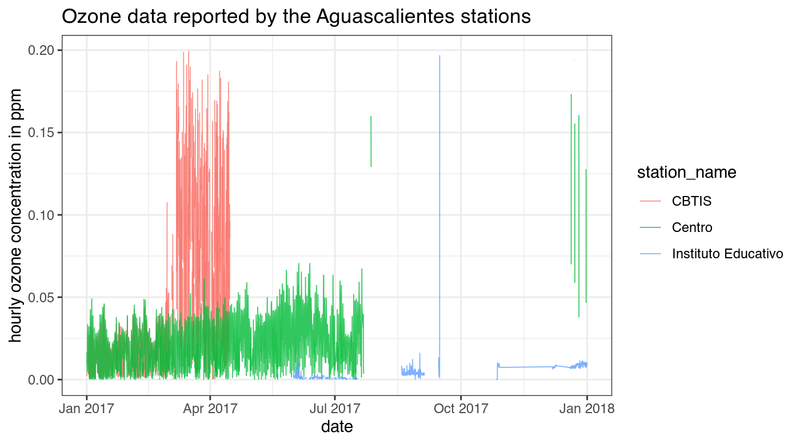 For example, if you visit the Mexicali air quality website you’ll see that they have a section reporting recent PM10 pollution values, but when you query SINAICA for the dates supported by all the Mexicali stations, none support downloading recent PM10 data. Furthermore SINAICA only has manually collected data available, while the data at the Mexicali air quality website seems to be automatically collected, since it’s available hourly. Guess they just haven’t gotten around to connecting this new air quality information source to SINAICA. The data reported to SINAICA is supposed to be checked for extreme values and errors, but this is quite often not possible. In addition, when you query data from the SINAICA website it automatically removes all O3 values above 0.2, PM10 above 600, PM2.5 above 175, NO2 above 0.21, SO2 above 0.2, and for CO above 15. But we know that, particularly in Mexico City and Guadalajara, there have been days where the O3 values have been above 0.2 ppm. The functions in this package have a remove_extremes option to mimic this behavior, but by default it is not enabled.